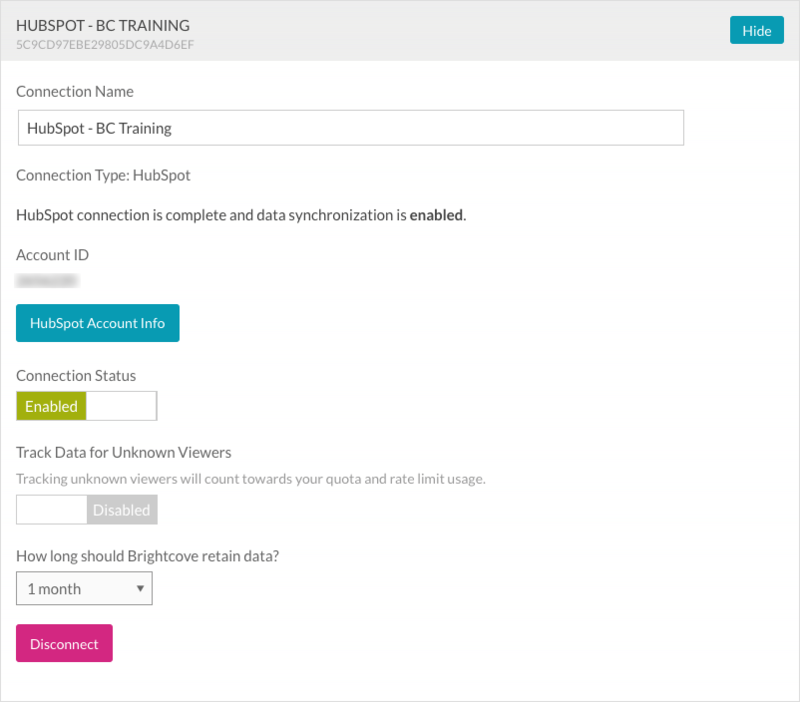 The Audience module allows Video Cloud to synchronize viewing data from Brightcove Players to HubSpot. Once in HubSpot, this data can be used for segmentation, campaign logic, reports, lead scoring, and personalizing communications. Using the Standard (REST API) method - With this method, Audience will only track viewing data for known viewers. 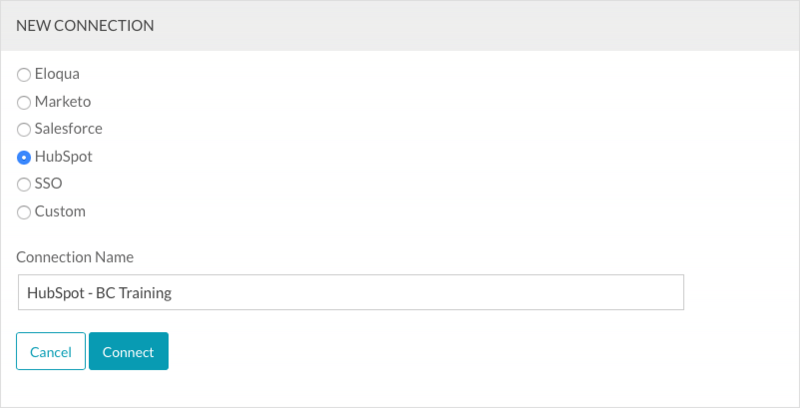 By default, lead forms will only be shown to unknown viewers. This method is covered in this topic. Using the High Volume (Client-Side API) method - With this method, Audience will track viewing data for all viewers. For information on this type of integration, see Integrating Video Cloud with HubSpot Using the Client-Side APIs. Lead forms - Create HubSpot forms that will appear automatically as viewers watch videos. For information, see Creating Custom Lead Forms for HubSpot. Follow these steps to setup the connection between Video Cloud and HubSpot. Select HubSpot as the integration. Click Connect to HubSpot . 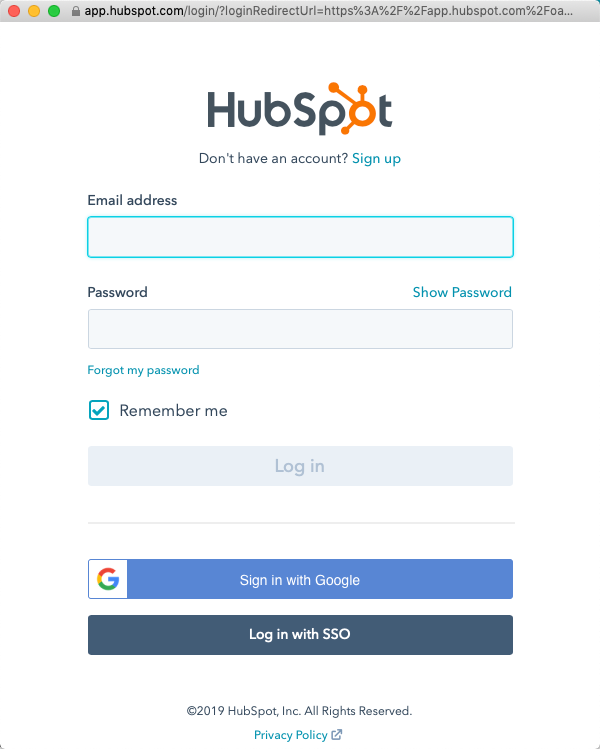 You will be prompted to sign in to HubSpot. Enter your Email Address and Password. Click Log In. If the login is successful, you will prompted to allow Brightcove Video Connect to access your account. Click Grant access. The Video Cloud connection to HubSpot is now set up and ready to use. 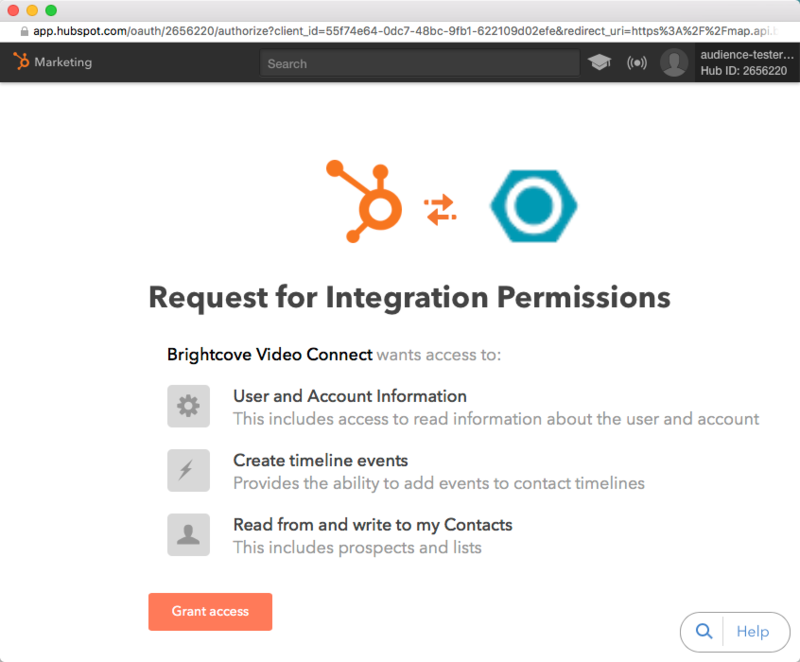 Once the Video Cloud to HubSpot connection has been made, you can configure the integration. Click HubSpot Account Info to display the connected HubSpot account info. By default, the Connection Status will be Enabled. The Connection Status determines if Video Cloud video engagement data is sent to HubSpot. To remove the integration with HubSpot, click Disconnect. The Audience module supports multiple connections to marketing platforms. Click Add New Connection to configure additional integrations. 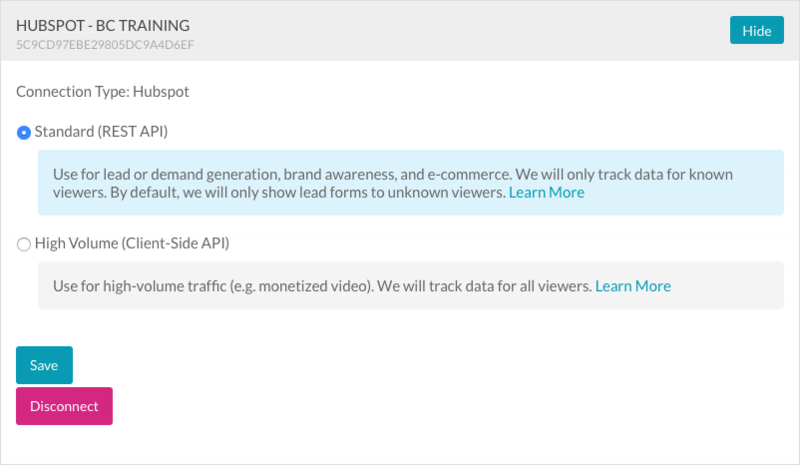 When the integration is configured, test the integration to confirm that video view data is being sent to HubSpot. For information on verifying the integration, see the HubSpot REST API Integration Testing Guide. Video engagement data will only be sent to HubSpot when you are using an Audience-enabled video player. For information on creating an Audience-enabled Brightcove Player, see Creating an Audience-enabled Player. Audience will then pass that value along to HubSpot as another field that is synced. HubSpot cookie- When the player loads, Audience looks to see if the user has been cookied by HubSpot already. If so, Audience will ask HubSpot if it knows who the user is via the cookie value. If HubSpot returns a contact, Audience will associate all the viewing data with that user. One possible scenario is to create video landing pages with a URL that’s been uniquely generated for tracking purposes. The Audience module will then use the URL parameter to look up the user server-side and sync viewing data.